After first launching the Ergorapido handstick vacuum ten years ago, Electrolux has been listening to consumers to find out what they love and loathe about the vacuuming experience. Those insights (as well as improvements in battery life and product engineering) have gone into the development of the latest range of Ergorapido vacuums, which are going to hit retail stores early next year. The Electrolux Ergorapido handstick in Watermelon Red. 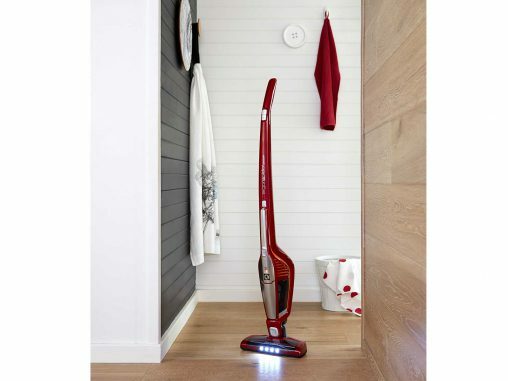 According to Electrolux’s product marketing manager for floorcare, Noel Hsu, the brand has “added a lot of unique features” to the products over the years, including LED lights at the front to help brighten up dark nooks, and BrushRollClean feature that cuts hair and fibres that may become caught in the brush roll, ensuring the user doesn’t have to get their hands dirty cleaning their cleaner. We’ve had these for 10 years now, so we’ve been through two generations. We did research to find out what the consumer wants from these vacuums. When we did the survey, we realised there was nothing wrong with this product. It comes in so many different colours which consumers like, because this product is designed to be displayed. It’s designed to do the instant cleaning job — you’re not supposed to put them in the cupboard, and when you want to use them you have to pull them out. That’s too much trouble. They’re designed to sit in any part of the household and you can clean as you go. While the name Ergorapido doesn’t really jump off the page (it certainly doesn’t read as well as it sounds when spoken aloud) the product really comes into its own during demonstration. It gets points for manoeuvrability and convenience (it zips quite easily over floors while maintaining suction) and the new design allows the appliance to stand up on its own. The aesthetics of the new Ergorapidos are also a winner. The brand has added airbrushed metallic inlays and stripes of Electrolux orange (which it intends to roll out across more products in the future) and it comes in a range of colours, which Hsu insisted looked good out on display in the home. The 18-volt model is available in Steel Blue, Watermelon Red and Tungsten (RRP $329) while an Ice White 14.4-volt model is also available (RRP $249).